Prototype's continuity is set in New York. Well, it's set in "New York Zero," which is what the city has become after an apocalyptic biological disaster. Still, it's New York, home of some of the most famous athletic venues in the world. The original Prototype, set entirely on Manhattan, featured a Madison Square Garden-style building, even if because of licensing restrictions, the game couldn't really describe it as such (though it did offer a landmark collectible.) MSG reappears in Prototype 2, scene of a late-game boss battle inside the "Red Zone," which is a thoroughly overrun Manhattan. But Prototype 2 begins in other boroughs, one of them recognizably the Bronx. 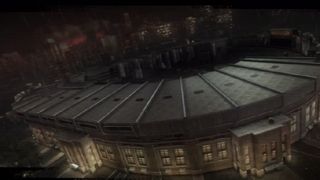 Naturally that meant a cameo by Yankee Stadium, and it too is the venue for a super-powered badass throwdown. This is "Rosman Stadium," at least I think that is the facility's name, judging by the ruined sign I inspected before jumping in. I asked Radical how "Rosman Stadium" got its name, and the answer was quite simple. It's named for Ken Rosman, the head of the studio that made the game. In the game, it has been converted into a staging ground for the Blackwatch corporation's "Project Orion". Here's a video of how you'll throwdown in the mission set there. The alternate future outcome for this so-called hallowed ground isn't so unbelievable to my mind. I have every faith those fascist Yankees are would salute and do the bidding of those authoritarian Blackwatch bastards.